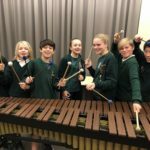 Our Marimba Group is first up at 7pm – so make sure you arrive early! The rest of the concert will feature a fabulous range of percussion groups and soloists from around Christchurch. Christchurch’s annual all-percussion showcase concert with music from around the globe. Run by Pandemonium Percussion and featuring over 100 performers from school, community and professional groups. This year’s concert features the New Zealand premiere performance of the new work for percussion octet and piano, ‘Cloud Folk’, by New Zealand composer John Psathas and performed by Pandemonium and friends.